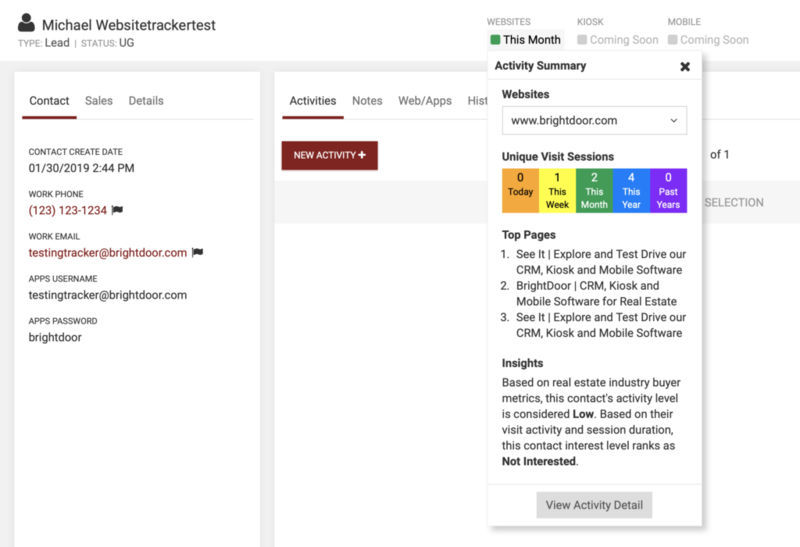 BrightDoor Central’s newest feature SiteTrack provides the ability for BD Central users to see contact website session information in a useful, actionable manner. This section will highlight where this data is viewable in BrightDoor Central. Data is viewable as a Dashboard Widget or directly in a contact’s record. 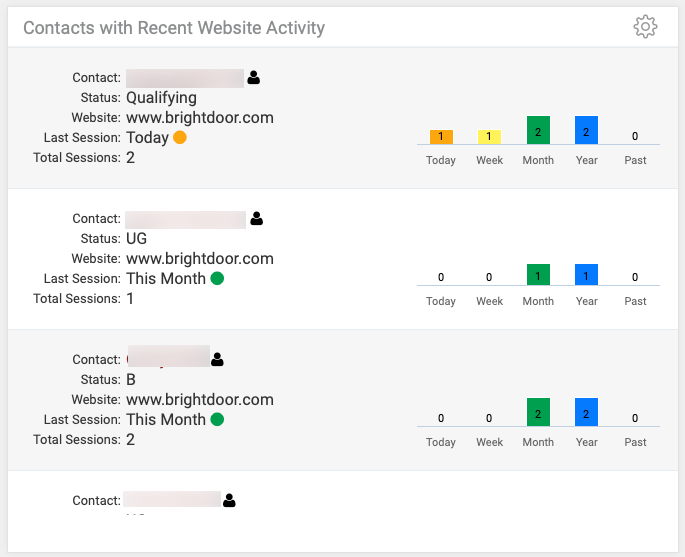 This widget helps visualize top 10 BDC contacts with recent website activity, it allows user to view assigned or all BDC contacts (if user has permission to), along with time duration filter. e.g. 30, 60 and 90 days. Widget shows contacts in reverse-chronological order. It gives some key information about contact like last website visited, last visit time, total unique sessions from the beginning till date. Widget shows breakup of sessions count in simple bar chart. Contact’s SiteTrack activity details are available under the main contact view page. There are two places where information can be seen: a quick popup or in more detail in the ‘Web/Apps’ section. Activity Summary: click on the link below label WEBSITES to view activity summary popup. This window allows you to select a website from a list of websites the contact has visited in the past. It shows information regarding total unique sessions breakup, Top three pages visited, Activity level and interest level for buying property. In the chart below, EITHER the daily site visit total OR page views per visit trigger that activity level grade (not both). The timeline for visit & page views should be a rolling 30 day window from the current day’s date. In the chart below, ALL of the metrics per row must be achieved in order to for the Insights grade to be achieved. The timeline should be a rolling 60 day window from the current day’s date. According to real estate industry metrics, the average number of days buyers spend shopping for homes is 60 days (two months) and the total time from search to purchase is 120 days (4 months). To extrapolate the 60 days of search, we can assume that they spend around 30 days in online research and the other 30 days touring homes and making a final decision. So, website activity should be high in a fairly narrow 30 day window (activity level). 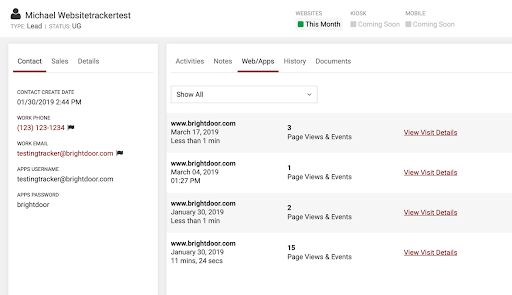 To separate the interest from activity, we require the user satisfy both visit and page view metrics on the activity side, along with some on-page triggers (watched video, clicked brochure link, etc) as a determining factor. 2. Activity List: Under the “Web/Apps” tab select the Websites option from the drop down to list activities related to SiteTrack. Activities are grouped based on website pages and a session that a contact has visited. “Visit Details” link shows all the action contact has performed on various pages of the website and also provide link to the pages under view column. Note a session ends after 15 minutes of no activity.